You will need to set aside 4 to 5 days depending on the amount of fabric you own. If it takes longer, you certainly know you have more fabric than you can use in two lifetimes! Let’s start going through the tons of fabric we’ve “collected” to make those “special” projects (which we never completed). Start SORTING your fabric into the above categories. Depending on the amount of fabric you own, this step can take 1 to 2 days. If you come across fabric you haven’t used in two years, get rid of it! If you haven’t used it by now, you probably won’t! Sell it on E-Bay, donate it to your local senior citizen friendship club or simply THROW IT OUT! Use your sewing table or other large CLEANED surface (which should be done by now) to refold everything into thirds. I learned a new TRICK from the shop owners in the NYC fabric district for folding large yardage of fabric. Take a YARD STICK or a BROOM HANDLE and wrap the yardage AROUND IT. Then lay the fabric down, pull out the yard stick and fold in thirds. 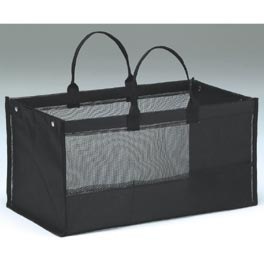 When you’ve finished sorting, you will need to acquire baskets or containers (plastic, wicker or cardboard). Here’s a photo of the baskets I’ve purchased in the past. They measure 12 inches by 16 inches and 5 inches high. Anything close is good. I purchased these for $1 each at a discount odd lot store. I’ve also found awesome fabric covered baskets at both Home Goods and Linens n Things for $3 to $5 each. Look how easy it is to see the fabric? 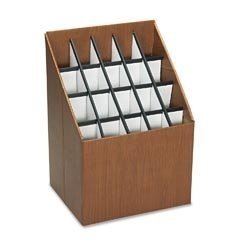 Now when you take one basket out of your fabric cabinet or shelf, it all stays neat. I also purchased some that were 8 inches high for my bulkier fabric such as chenille and fleece. 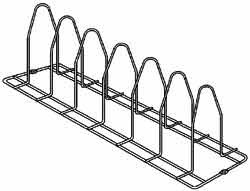 Now would be a good time to measure the depth of your shelving as you should not purchase baskets longer than that measurement. Most shelving measures between 16” and 24” deep. 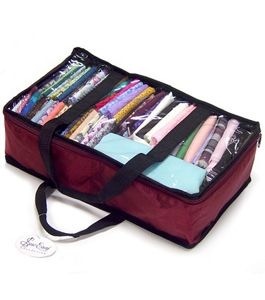 Purchase as many as you need to hold all your fabric. Shoe boxes are too small for this purpose. Putting the fabric in baskets enables you to pull out the baskets and remove only the fabric you need (no more digging for a particular fabric). If you’ve had your fabric stacked one on top of another, you know how frustrating it is to pull out one piece of fabric and have the entire stack fall. Also, stacking fabric does not give you a clear view of what you have. Another method is to use Comic Book Boards to organize your fabric.Caro of Split Yarn came up with this brilliant idea and Carla has a simple fabric folding tutorial here. For those of you who purchase bolts of fabric, you will need to acquire large plastic or aluminum garbage cans if you want to store them standing up. You can also stack them on the shelves. Put your sorted fabric (which is now folded neatly) in the baskets one behind the other (so you can easily see what is in each basket). LABEL each basket and put them on your shelves or whatever other storage system you have. A label maker is a great tool to have. You can buy one for under $30 at your local office supply store. Otherwise, type and print up some labels on your computer. It may be impossible for some of you to do this in consecutive days…however, there is no reason you cannot finish this within a week. For those of you (like myself) who like to serge and wash all fabric when purchased, add TWO DAYS to your organization project. NOTE: it is best to serge raw ends of all your fabric as you bring into the house and then wash it, so you’re ready to sew when inspiration strikes. 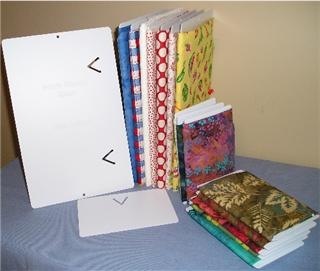 « THE SEWING ROOM ORGANIZATION CHALLENGE BEGINS NOW! I am so glad i found this web sight. I am in need of help to clean things up, and i think you can help me. I will write again to let you know how i am doing. What a wonderful idea for fabric organization. I have put it in bins and find it isn’t too successful as I have them stacked and never know where to find any one color I am looking for. Will chance over to your method of doing things. How do I register for this blog. I need so much help! New floors and paint will be happening soon in my sewing room and I want the whole room re-organized. I am so much more productive when the room is less cluttered. GreenOlive…glad I could inspire you. BTW, I LOVE your site…I’ve added to my blog roll! Barb…are you making any progress? Update us! Alma…great idea! 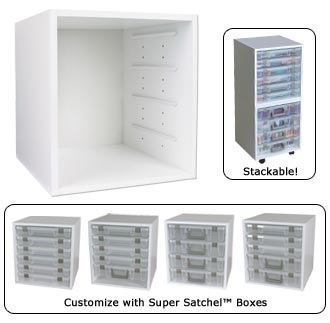 Sounds much like the way I store my knit fabrics, except they are in cube storage systems from Target. I only wish I had found clear cubes as it would have made the fabric easily to see. I’d love to see pics Alma…I get a kick out of seeing everyone’s stash! Where did you get the black storage units for your fabric? You do a great job organizing!! Wow great job, I love the black storage units too. Now if you could come over and organize my kids craft room, my paints and my gift wrap I would be oh so happy! I just love what you did. It’ totaly amazing. You should come to my house. I know everybody wants you to come over, but you know when you’re the best. oh by the way I blogged about it on my blog and linked to you. thank you! I love this whole process layed out (not that I haven’t done a million times in the past…) I always find that after a fair or show the sewing room looks like dumpster and I usually close the door for a few days to get my bearings before trying to re-organize…..maybe after thanksgiving??? Inspirational! Trying to sort out my sewing room at the moment. 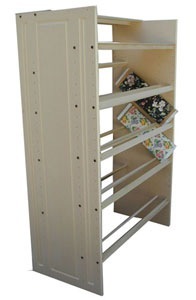 I have one of the antonius systems from Ikea and I found that’s great for storing my fabrics. But I struggle finding solutions for rolls. Jess…for my rolls of fabric, I usually stand them up in a big round metal garbage can. Good luck! what size do I cut the fabric into squares for a baby quilt? “If you come across fabric you haven’t used in two years, get rid of it!” REALLY? You must be nuts! I have fabric that is much more “vintage” than that. It’s still useful and wonderful and it cost less than half of what fabrics cost today.